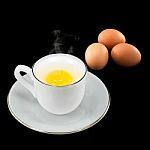 Reading this piece on organic eggs today I was reminded of the famous painting of a pipe by Rene Magritte, entitled “Ceci n’est pas une pipe” or “This is not a pipe”, it is merely the representation of a pipe. Or, nothing is what it seems. In the piece, it is revealed that organic eggs are treated with an antibiotic, gentimicin. This is actually used to seal in the tiny hole made to vaccinate the egg against Marek’s disease. This is done on the first day of the life cycle of the egg. But to be classified as “organic”, the egg only needs to be free of antibiotics from the second day of life so this egg will go on to hatch and the eggs from that chicken will come to our tables. Is this still an “organic egg”? (The organic eggs sold for consumption are, however, not treated with gentimicin). How does this make us feel about the categorization of these eggs as organic? For me, it is reminiscent of the bump down to earth I felt when I discovered that the organic strawberries that my toddlers loved, and that I paid a hefty premium for, actually started life in the nursery doused with methyl bromide, soil sterilizer and pesticide. At the time of this report, two years ago, there were no organic nurseries in California which provide fruit and seedlings to consumers all over the world. Yet some would opt for the organic produce from those very seedlings over conventional produce and pay more for it. Are they really getting “organic strawberries”? The intention here is not to devalue organic methods but to underline the fact that debates on the food system are often disconnected from ground realities. Seedlings, eggs etc will be prone to pests and diseases and we have to find a way to protect what we grow. Insistence on some arbitrary “natural” , or “local” standard ignores the fact that pests do exist in nature and crops have to be protected from them. This insistence on unreal qualities is then exploited by retailers who will use terms like “natural”, “local” or “sustainable” which actually have no backing or meaning to them, on labels and make a profit by selling a higher quantity. As the labeling war wages on in different states, it might be a good idea to pause for a moment and reflect on what it would achieve. If current labels mask loopholes, would future labels be of any value? More importantly, is it going to be worth the time, money and resources that are currently being directed into this contest? There are much bigger problems we need to attend to: too many people going hungry , too much food being wasted, sources of water running alarmingly low levels, unpredictable climate posing challenges to our current ways of growing food; all of which need our energy more than semantics. This entry was posted in Farm Technology, Food Safety, Green, Living and tagged Farming Technology, food security, Green. Bookmark the permalink.